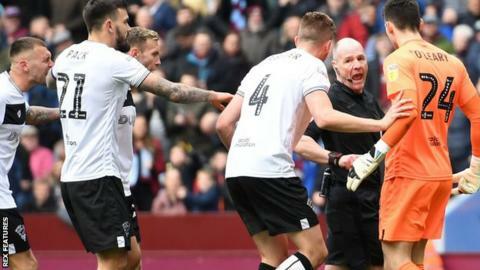 Bristol City have been charged by the Football Association for failing to ensure the "orderly" conduct of their players in Saturday's Championship defeat by Aston Villa. Referee Scott Duncan was surrounded by Robins players after he awarded Villa a penalty in the 53rd minute. Bristol, who had Andreas Weimann and Max O'Leary booked for their reactions, have until 23 April to respond. Ex-City striker Tammy Abraham scored from the spot in a 2-1 win for Villa.